These generous businesses open up their shops to help AWS pets find homes. Whether keeping an adoptable pet on premises or hosting us for an adoption weekend, these businesses and their employees are committed to loving and caring for pets in need. Throughout northern New England, we operate satellite adoption centers in pet supply stores. By housing the small animals at these stores, we make it more convenient for adopters and increase the number of animals we are able to help. Meet a cat or small animal and adopt directly from the store. Andy’s Agway – Situated on a hill in Dayton, Andy’s Agway is a regular adoption location for adult cats, often barn or semi-social cats. Stop by to shop and adopt! Ann-imals – Located in York, Ann-imals was one of our first satellite adoption locations and has helped more than 100 cats find new homes. Pet Quarters – On Payne Road in Scarborough, you’ll find a cat (or an occasional rabbit) hanging out at Pet Quarters, just waiting for their new family to come along. Super Dogs & Cats – This pet supply shop in Biddeford regularly hosts cats for adoption. The cats love greeting Super Dogs & Cats customers and being social media ambassadors for the store. PetSmart – For many years, Biddeford PetSmart has been a cat satellite adoption location, where 4-8 cats are cared for at any given time. In 2016, the partnership expanded to include small animals in several different PetSmart locations. 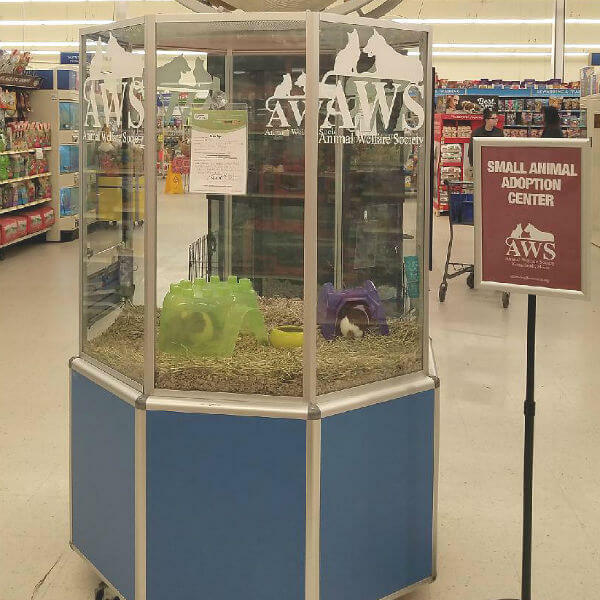 Since 2016, more than 2,000 AWS small animals (including rabbits, birds, mice and guinea pigs) have found new homes out of PetSmart stores throughout northern New England. The following pet supply stores graciously open up their locations on a regular basis for very special adoption events. PetLife – Several times per year, PetLife stores in Sanford and Saco, host AWS cats and dogs looking for new homes. Visit our calendar of events to see when you’ll be able to find a new pet at a PetLife near you. PetSmart – We are honored to take part in PetSmart Charities National Adoption Weekends, which take place four times per year. During the adoption weekend, we have a variety of pets ready to go home from the Biddeford Store, often including puppies and kittens. Visit our event calendar to see when the next Adoption Weekend will be held.